Dynamic Investments will enable Financial Planners to gain more clients and provide more valuable services than they do today. The world of investing is about to change at a fundamental level. The National Association of Online Investors has released a new approach to portfolio design and to investing in general in the form of Dynamic Investment Theory (DIT). This is the first viable alternative to Modern Portfolio Theory (MPT) since 1952 when that approach was introduced to the market as is still in use today. DIT creates a revolutionary investment type called Dynamic Investments (DIs) that periodically and automatically change their holdings based on market price trends. By being "market-sensitive" DIs produce returns that are multiple times higher than MPT portfolios with significantly less risk and no active management required. 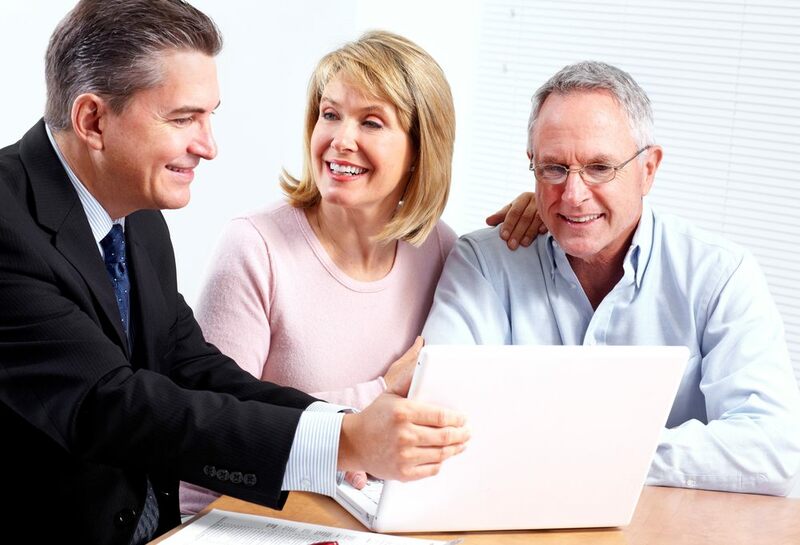 The purpose of this Web page is to show how this new approach to investing will enable Certified Financial Planners to become the advisor type of choice in the future of investing by providing total financial solutions that include investing in addition to planning. One of the greatest assets owned by the National Association of Online Investors (NAOI) is the knowledge we gain from regular interaction with our students / members who are average people with money to invest. From over 20 years of teaching personal investing via online courses, published books and in the classroom, we know that to become effective custodians of their savings, the public needs the three components of wealth creation/preservation shown below. Together they make up what we call a Total Financial Solution. It is virtually impossible today for individuals to find one advisor type that provides all three of these components, or even two for that matter. In the future of investing, the NAOI believes that the Certified Financial Planner is best positioned to offer all three of these components in a total solutions package. Below I explain why and how. To solve a problem it first must be understood. Investors today are dependent on "experts"
..... and their are other problems. When an individual investor is forced to deal with one advisor for financial planning and another advisor for investing advice, often the planning aspects of a total financial solution are either diluted or ignored. The use of the new NAOI Dynamic Investment product type, discussed just below, enables Financial Planners to seamlessly integrate planning and investing into one package. By doing so, the negatives associated with working with an Investment Advisor, as discussed above, are eliminated. The manner in which Financial Planners can offer the Total Financial Solution that the public is looking fore is explained next, beginning with a short description of what Dynamic Investments are and how they work. DIs are investing "products" and this is key to enabling Financial Planners to offer total financial solutions. In 2008, after teaching MPT methods for over a decade, the NAOI paused all future investing classes. Why? Because during that year when the stock market crashed, the MPT portfolios we were teaching students how to create crashed right along with it. We realized at that point that MPT methods no longer worked in today's markets and we initiated a study to find a better approach to portfolio design and investing in general. After an extensive, multi-year effort we found this better approach in the form of Dynamic Investment Theory (DIT). DIT sets the logic and defines the rules for the creation of a next-generation investment type called Dynamic Investments (DIs). The structure and components of all DIs is shown in the nearby diagram. 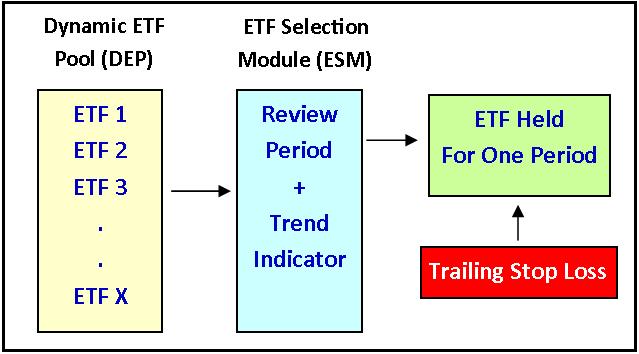 DIs periodically sample market price trends and automatically change the Exchange Traded Funds (ETFs) they hold in an effort to buy only uptrending ETFs while selling or avoiding those trending down. By doing so they produce returns significantly higher than any MPT portfolio with less risk and no active management required. Each DI is a portfolio "product" and their introduction into the market changes everything. Click here for a more detailed explanation of how DIs work. The table below shows the performance of the simplest Dynamic Investment designed by the NAOI that rotates only between a stock and a bond ETF based on a quarterly sampling of the price trends of each. We call this the NAOI Core DI. Shown are the yearly returns and the average annual return for the 10 year period from 2008-2017. Also shown is the Sharpe Ratio which is a measure of how much return is achieved for each unit of risk taken - the higher the better. For comparison purposes the performance during the period of a traditional 60% Stock / 40% Bond MPT portfolio is displayed in the bottom row of the table. Why is the performance of the Dynamic Investment so superior to that of the MPT portfolio? Because the MPT, asset-allocation portfolio, by design, held both winning and losing investments at all times during the period. In contrast the DI is designed to hold ONLY winning investments while selling or avoiding losing investments. And the DI does so automatically based on objective observations of market data, not based on subjective human judgments. What Makes DIs "Investing Products"? DIs have the universal goal of capturing maximum returns with minimum risk in the areas of the market determined by the ETFs in their DEP. This is a universal goal that works for all investors. There is no need to customize DIs to match the risk tolerance of any investor. DIs are the market's first and only comprehensive investment - specifying not only the ETFs to work with by how they are to be traded and managed on an ongoing basis. As a result investors can buy them off-the-shelf from a variety of vendors and simply hold them for the long-term. These are active investments that are passively managed. Each DI can be seen as a "portfolio product". DIs automatically signal trades based on objective observations of empirical data, not based on human subjective judgments. This fact removes a massive risk element from the portfolio design and management process and significantly reduces its complexity. As standardized portfolio products, DIs can be sold by vendors from catalogs like the one shown just below. Each DI product will be created by an NAOI-trained DI Designer. In a DI Product Catalog performance data can be presented for each DI, enabling an investor to make informed purchase decisions. The productization of investing is the Holy Grail of the financial world that experts have been seeking for decades. They haven't found it; in DIs the NAOI has. And with the introduction of productized portfolios the world of investing suddenly becomes significantly simpler, more profitable and less risky. Note that this sample catalog is taken from The Amazing Future of Investing book discussed later on this page; thus the Chapter References in the table. You can see that when the world of investing is "productized" both portfolio sellers and buyers are winners. Vendors are not bogged down in the error-prone process of customizing portfolios for each investor and individuals have all of the data needed to make informed purchase decisions. Customization is still possible and advisable. But it comes in the form of simply combining DI "building blocks" in a manner that meets the unique goals of an investor. Combining DIs creates "Dynamic Portfolios" that are discussed in more detail at this link. The NAOI believes that Certified Financial Planners who offer the following components of a Total Financial / Investing Solution will be the dominate advisor type in the future of investing. Education - An integral part of financial planning is education. Most Financial Planners provide a basic level of education related to the topics of interest to a client, e.g. taxes, estates, insurance, etc. However, those that also provide an education course in investing basics will have a distinct competitive advantage, not only among other financial planners, but also among other advisor types. For this purpose the NAOI works with CFPs to provide to their clients an Investing Basics Study Course and an array of online Financial Planning Calculators. Click the links for more information on each. Financial Planning - This, of course, is the component of a Total Financial Solution that CFPs are uniquely qualified to provide. There is no need to elaborate on it here other than to recognize the fact that it is an indispensable component of a total financial solution. Investing Assistance - Today most CFPs do not offer investing advice as a part of their paid services. As a result, they are not the first choice of individuals looking for professional help. But in a future of investing that is dominated by Dynamic Investment products, CFPs will be able to make DI recommendations without needing to be certified as an Investment Adviser or Broker. They will become "educators' in this area as explained next. The role of the CFP in this new environment will be to educate clients about how DIs work and then to show them a Catalog of DIs such as the one presented above. Suggestions related to which DI or DIs to select from this catalog (which can be provided by the NAOI) for a client's specific needs can be made by the CFP. But then it will be up to the client to either buy and implement them on their own using an online broker - it is extremely simply to do - or the client can work with an Investment Advisor/Broker to implement the DIs for them. In other words, the CFP simply points their client's in the right investing direction. No fiduciary or standard of suitability requirements are related to this type of education. Thus, the third component of a Total Financial / Investing Plan is in the control of the CFP and can be aligned with the provided financial planning. With the introduction of NAOI Dynamic Investments, Financial Planners can now offer Total Financial Planning and Investing Solutions. And the public will finally have ONE type of advisor to work with for all of their educational, financial and investing needs. It is extremely easy for a Financial Planner to understand how Dynamic Investment Theory and Dynamic Investments work and how to integrate them into their total solution offerings. All of the information needed is provided in the book entitled The Amazing Future of Investing as pictured nearby and described below. Five + years in the writing, this easy-to-read book changes the world of investing at a fundamental level. It transforms the way we invest from today's "static", buy-and-hold approach to a far more profitable and less risky "intelligent / dynamic", buy-and-sell approach. Presented in this book is the information needed to give Financial Planners a massive competitive advantage in the future of investing. Make no mistake, Dynamic Investment Theory (DIT) is not a minor tremor in the world of investing, it is a full blown earthquake. DIT changes virtually everything we have been taught about "how to invest" for the past 65+ years. So, there will be skeptics. And there should be. If you find yourself among them please take a minute and go to this page to see why the NAOI is ready, wiling and able to defend our conviction that DIT, not MPT, is the future of investing. The National Association of Online Investors (NAOI) offers a full array of support resources that give Certified Financial Planners a decided competitive advantage when the investing public looks for professional financial advice. Along with this advantage will come increased market share and revenue generation potential. These resources include, but are not limited to, the following with a link to more information for each. Email Updates: At the bottom of this Web page sign up for NAOI Email Updates to get notifications of NAOI developments and releases as they occur!